A colorful, cutesy “Kosher Basics” PowerPoint was the springboard for a well-received interactive presentation made by STAR-K Kosher Certification Assistant Director of Supervision Rabbi Mayer Kurcfeld for Cornell University senior dietetics students, on February 28. It preceded a tour of the STAR-K certified kosher kitchen on the Ithaca, New York, campus for the future registered dietitians. The presentation topics included: The Torah basis for Kashrus, ingredient sources, ritual slaughter, dairy and meat, vegetable checking for infestation, grape and wine products, Bishul Yisroel, the role of a Kosher certification agency, how to set up a kosher kitchen, and the practical application of the Kosher rules. 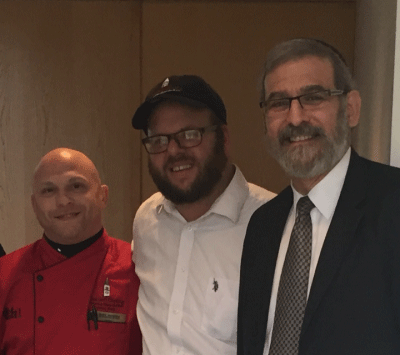 Chef Jason Haus and mashgiach Gavriel Ress were also present to provide a comprehensive overview of the Cornell Dining team who work together to accomplish STAR-K certified dining at Cornell. Cornell University’s Division of Nutritional Sciences is the largest academic unit in the United States devoted to the study of human nutrition, and one of the world’s preeminent institutions for nutrition education, research, and service. Upon graduating these students will assume leading positions in community, clinical and management settings.